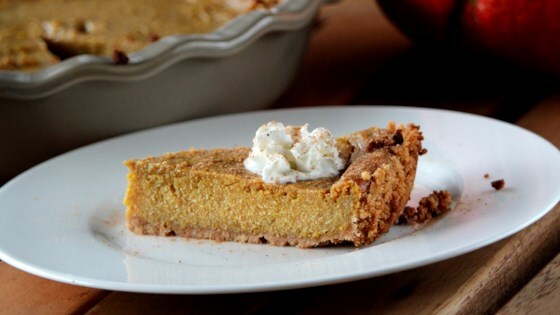 "Dairy-free and egg-free pumpkin pie filling using any pie crust of choice. I am gluten free, so like the Mi-Del® graham cracker pie crust from Whole Foods. Tastes like a Libby's® Pumpkin Pie that my 3-year-old loved!" Combine pumpkin puree, tofu, sugar, cornstarch, cinnamon, salt, vanilla extract, ginger, and cloves in a blender. Blend until silky smooth, scraping down the sides of the blender as needed. Pour mixture into pie crust. Bake in the preheated oven until lightly browned, about 15 minutes. Reduce oven to 350 degrees F (175 degrees C); bake until a knife inserted in the center comes out clean, 40 to 50 minutes. Refrigerate pie until chilled and set, 8 hours to overnight. If you're cooking for an allergen-sensitive person or want to make this truly vegan, double check the pie crust and other ingredients. Refrigerating pie overnight is optimal but optional.